Fourth grade students in North Carolina study North Carolina’s geography and history. One of my favorite parts of my job as media coordinator is collaboration with classroom teachers to bring lessons to life. Fourth graders in my school have been learning about the three regions of North Carolina, the coastal plain, the Piedmont, and the mountain region. Students spent several days in class researching industry, geography, and major landmarks in each region. In the past, students have created a map on cardboard paper using various materials. They have even created Live Museums where each pair of students showcased their learning by sharing with other grade levels waiting in the lunch line. 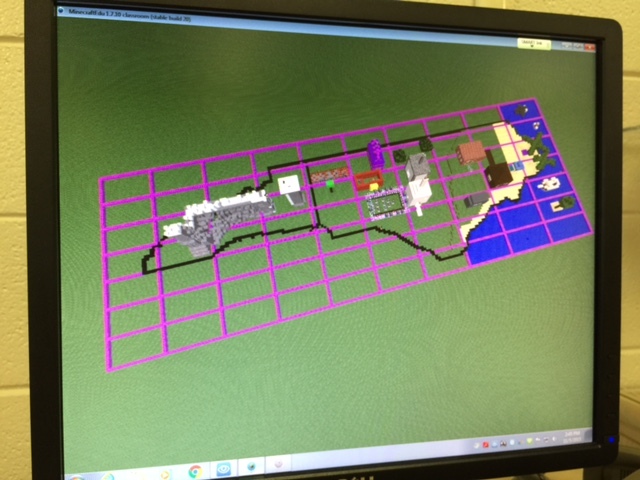 Fourth grade teachers at my school wanted to take it to a new level this year and allow students to create a map of the regions of North Carolina using MinecraftEdu. I have been running a MinecraftEdu club every Friday afternoon to test out ways to use MinecraftEdu in the classroom. My MinecraftEdu club has been exploring various lessons in the MinecraftEdu World Library and I have really seen the value in using MinecraftEdu to teach various concepts in the classroom. When fourth grade teachers approached me about the possibility of using MinecraftEdu in this lesson, I was ecstatic. The first thing I did to prepare for this lesson was look for a map with the North Carolina border already created in MinecraftEdu. I could not find a single one. So, I used the Flat World (Original Style) Map from the World Library as a starting point. 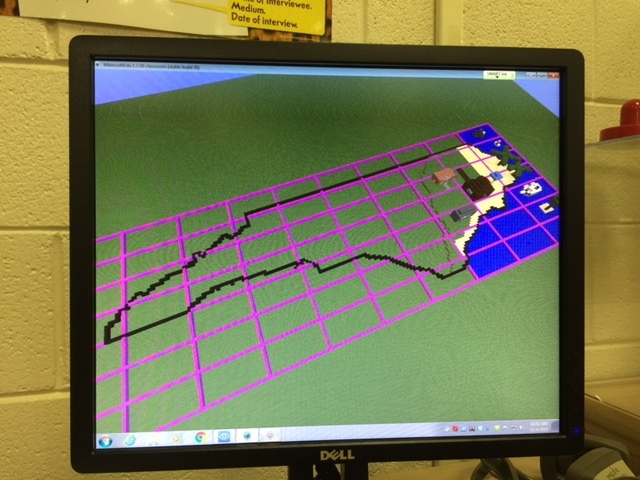 Using a North Carolina map with latitude and longitude lines, I began to block off my image to transfer into MinecraftEdu. 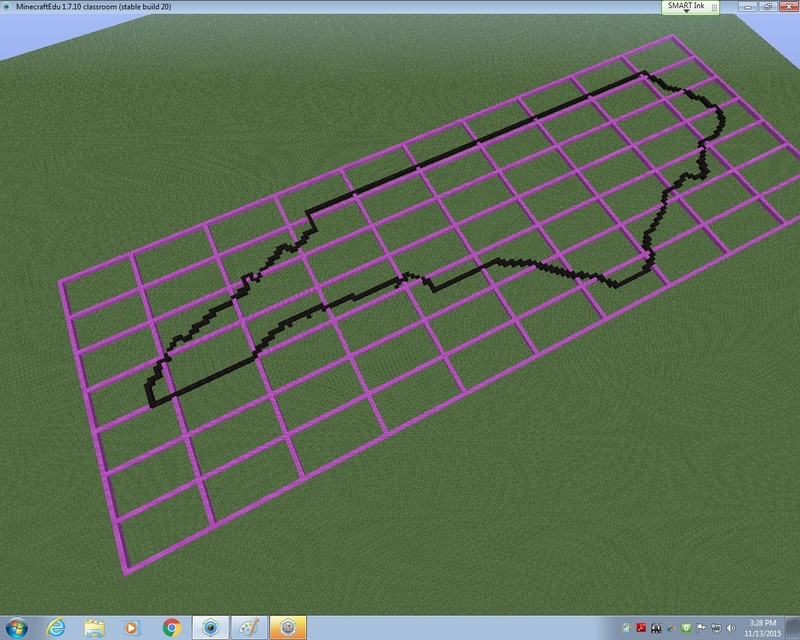 Basically, each latitude and longitude line would be separated by 20 MinecraftEdu blocks. 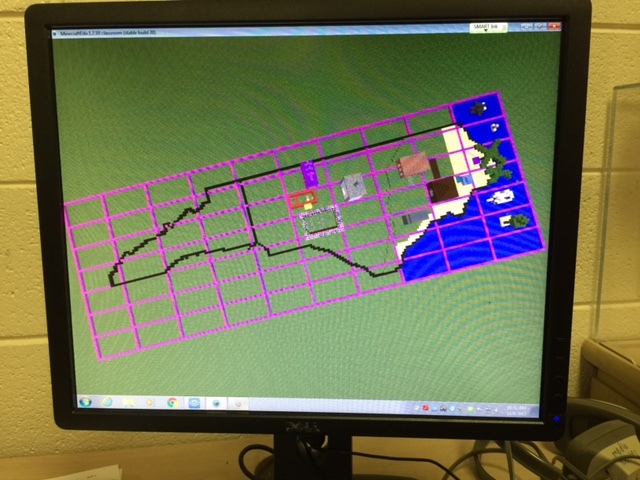 This allowed me to keep the integrity of North Carolina’s shape while keeping the area of the state manageable for my students to cover in the limited amount of time they would have in MinecraftEdu. Once the latitude and longitude lines were in, I started outlining the state using the paper copy of the map I had blocked off. I started on the east coast because I knew it would be difficult to do. I would place a few blocks, then fly to see if it looked right. Then I would place a few more blocks, and fly to see how they looked. It was basically trial and error. I abandoned the idea of creating the islands of the Outer Banks due to constraints in the area I had given myself. 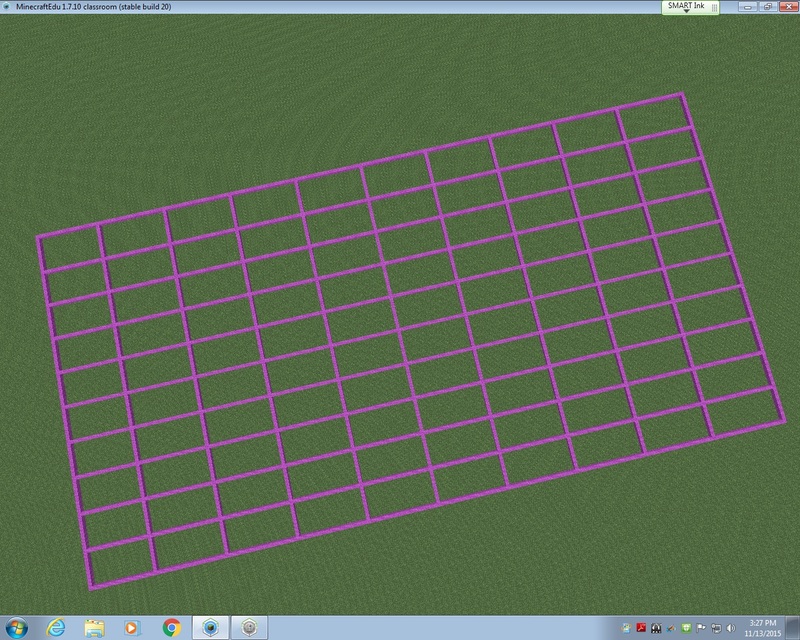 After a few hours of work, I am pretty proud of the final product that will be uploaded into the World Library soon. From this point on, it was up to the students! The teachers and I decided to start with the coastal region and build from east to west. Each region was given 45 minutes to work collaboratively to create symbols of what they had learned about their region. Students had various levels of experience in MinecraftEdu; some are in my MinecraftEdu club and some have never played before this project. Because the coastal region was first, we ran into some quick problems with the ocean (specifically the flooding of what would be South Carolina and Virginia) and had to start completely over at one point. Another problem we faced: I began by allowing students to remove lines of latitude and longitude if needed and upon seeing the black border of the state disappear, we started over and I told students they could not remove any pink or black blocks and they must contain the ocean in the blocks provided. After about an hour of working (including having to restart), the seven students assigned the coastal region were finished. They included a shark, a pirate ship, beach houses, seafood restaurants, sand for beaches, tourists tanning on the beach, and palm trees. The ocean even had a strong current in it to represent the movement of the waves! You can see they were very particular about keeping the Piedmont region out of their coastal plain, so they went as far as to create a visible division between the two regions. The Piedmont was next and within their 45 minutes, they created Bank of America stadium (Go Panthers! ), McDonald’s, and skyscrapers. They also created a forest of “apple” trees using oak seeds, but the oak trees overtook the skyscraper, so we had to cut down an entire forest. This led to an spontaneous discussion about deforestation and a debate about cutting down trees vs industry, which was an excellent unexpected learning opportunity! The seven students who studied the Piedmont also took it upon themselves to make a border so the mountain region would not build in their area. The students were very territorial about their regions! The last region to build was the mountain region. They discussed where the foothills would be and decided as a group (with my permission) to move the border created by the Piedmont so they could have ample room to build the mountains and have a section for the foothills. They were adamant about having the foothills represented as that’s where our school is located. After 45 minutes, the mountain region had created a good-sized mountain range and the Mount Airy Granite Rock Quarry. 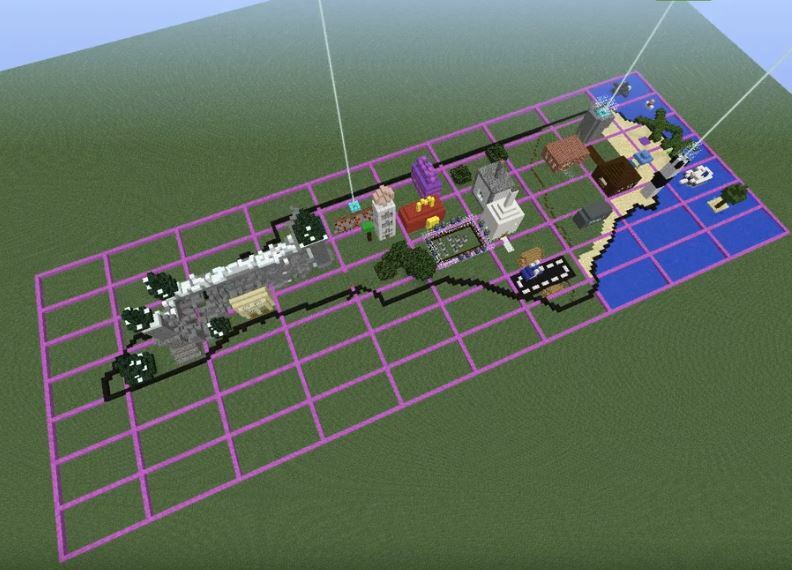 Once all students in the class had the opportunity to add something to the map, the MinecraftEdu club members put on the finishing touches. They dubbed themselves “experts” and made everything come together nicely! They also added a lighthouse to the North Carolina coast, the Krispy Kreme headquarters (with a donut on the top, HA), a race track to represent North Carolina’s role in the creation of professional racing, and the Biltmore House in the mountains. The final touch was a beacon to show where our school is located in the foothills. As I watched the students work, I was amazed at the level of knowledge they had about North Carolina’s geography, industry, and landmarks! These students came with an idea about what they could add to the map to represent North Carolina and they worked together so well to create what I consider to be a masterpiece. I posted several times on Twitter with updates on this project, which were shared and liked many times (thank you for that). Each day I would remind the students that their work was being shared globally and many people were waiting to see the finished product. The students gave everything they had to this project and far surpassed any expectations I had for this project. Their learning is evident in ways that a standardized test could never showcase. I am a firm believe in the power of MinecraftEdu in school and I can’t wait to work with my fifth grade teachers to create biomes in MinecraftEdu in the coming weeks! *A link to a walk-through of the completed NC Region Map will be added soon.